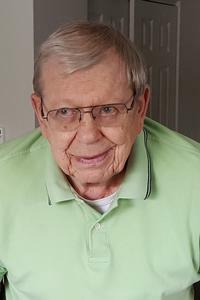 Roger Buikema, age 88 of Holland, passed away Saturday, March 23, 2019. Roger was raised in Grand Haven and graduated from Grand Haven High School. He served in the United States Army, as a Staff Sargent, during the Korean Conflict. Roger retired from Holland Public Schools where he served as a custodian, bus driver, and sold tickets at both football and basketball games for over 38 years. He was a Life Member, served on the Honor Guard, and Past Commander of the VFW Post 2144 and was an avid golfer. Roger was preceded in death by his first wife, Joan; children, Roger Paul Buikema, Debra Polinsky, and Steve Polinsky; grandsons, Troy Ganzevoort and Dale Buikema. Surviving is his wife, Isla; children, Claudia and Glenn Ganzevoort, Tami and Rick Elzinga, Jack R. and Terri Buikema, and Kyle and Debbie Buikema; 12 grandchildren, 23 great grandchildren, and one great great grandson; siblings, Judy Villella, Ruth Anne and Henry DeWitt, Don and Avey Buikema, and Linda and Ron Shackelford; in-laws, Joyce Stille and Dail Patterson; several nephews, nieces, and cousins. Funeral and military services will be held at 11 am Friday (March 29) at the Dykstra Funeral Home-Northwood Chapel, 295 Douglas Avenue. Burial will be in Pilgrim Home Cemetery. Visitation will be 5-7 pm Thursday (March 28) also at the funeral home. Memorial contributions may be made to the Van Andel Institute for Parkinson's Research or Hospice of Holland.